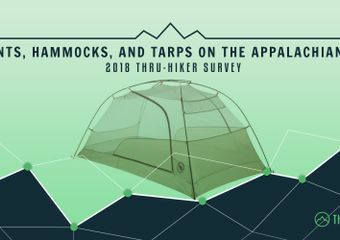 We surveyed 310 section and thru-hikers who were on the Appalachian Trail (AT) in 2018. They shared about the sleeping bags they used, hammock quilts/underquilts, and sleeping pads. We also looked at our data over time and noticed a trend that’s becoming more popular each year, and looked at some differences in sleeping gear based on hammock use. For the details, keep reading—otherwise skip to the TL;DR at the end. 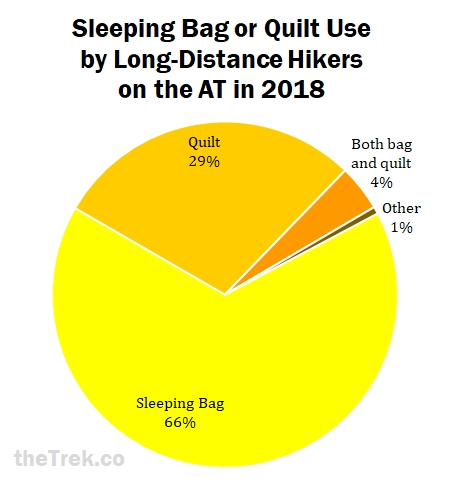 When looking at the preferred type of sleeping bag, most hikers opted for the traditional sleeping bag, but backpacking quilts were also fairly popular, being used by at least one-third (33%) of hikers. One thru-hiker said he used only a sleeping bag liner for the majority of his hike. This hiker traveled northbound from May to September, discarding his quilt when the weather warmed up. So I counted him with the quilt users. Regarding the hikers who carried both a quilt and a bag, there could be several reasons for this. At least one hiker brought both because they shared a tent on colder nights instead of sleeping in a hammock. The others may have been in a similar situation or may have had different reasons. 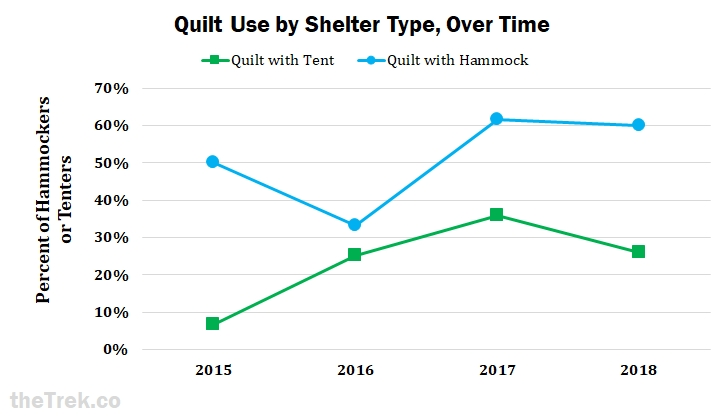 While the quilt trend declined slightly since 2017, we’ve continued to see an overall upward trend in quilts becoming increasingly popular for both hammock users and tent users, even as they are overall more popular for use with hammocks. 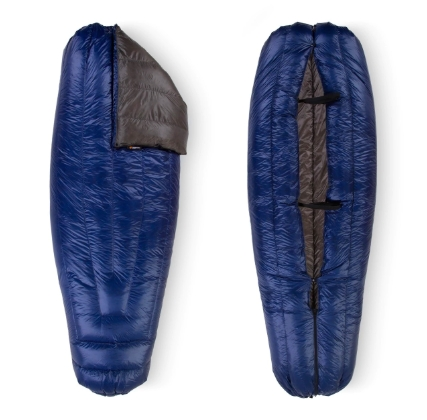 About one-third of hikers (104 out of 310) used more than one sleeping bag during their hike. In past years, they have typically kept the same type of bag (quilt vs. traditional) and the same fill type, so we did not ask follow-up questions about that this year. Changes are usually on the level of choosing different models, or seasonal changes to bags of different temperature ratings. All three were all fairly popular choices, but natural down was the most common, used by almost half of hikers. A few hikers actually used bags that were synthetic on one side but natural down on the other. The concept for these bags is that they have the water-resistant feature of synthetic fill on the bottom side (which would become damp more easily on the ground), but the warmth and lighter weight of natural down on the top. 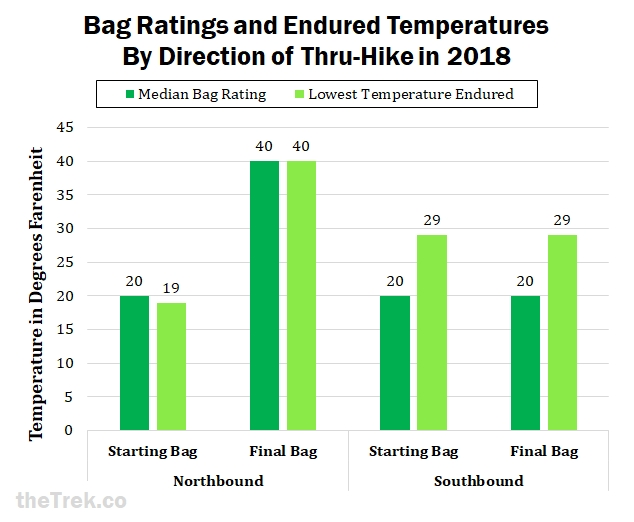 For northbounders, the median lowest temperature endured was 19 degrees Fahrenheit, and northbounders’ first bags had a median temperature rating of 20F. Their final bags had a median temperature rating of 40F, which was the median lowest temperature they endured in these bags. Future northbound hikers, be aware that temperatures fluctuate each year. Additionally, a quarter of northbounders endured temperatures between 12F and 19F, with the lowest 25% of hikers enduring temperatures from -19F to 12F. For southbounders, the median lowest temperature they endured was 29F. No southbounders reported using more than one bag, so their initial and ultimate ratings were the same. Based on this data and data from past years, I would generally recommend that southbounders use a sleeping bag with a rating of 25F from the start. The lowest endured temperature reported by a 2018 southbounder was 10F. 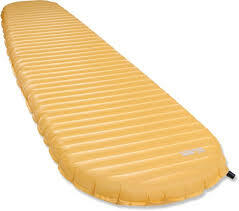 Overall, three-quarters of hikers used an inflatable sleeping pad, about one-quarter used a foam pad, and some used a pad that has both some foam and some inflation. 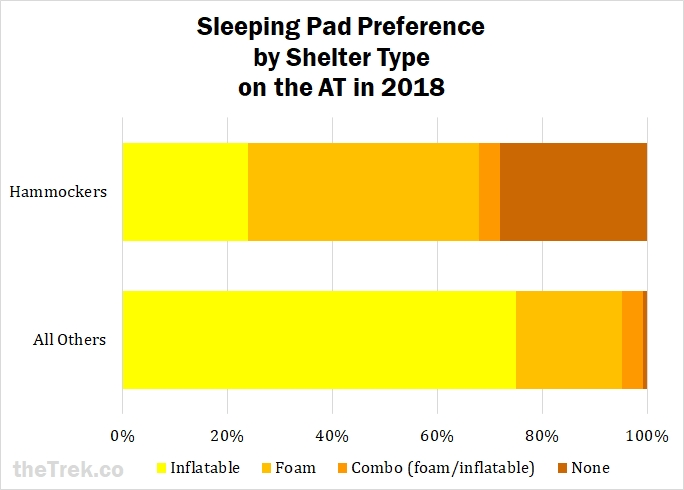 However, hammock users showed widely different preference for foam pads or no pad at all, compared to all other hikers. Inflatable pads can be difficult in hammocks unless the hammock has a built-in sleeve for them. Unless hikers want the flexibility of using the lean-to shelters, hammock users don’t necessarily need a sleeping pad on the Green Tunnel, where you can reliably find plenty of good hammocking trees. Initially, I was surprised to see the REI Igneo drop off the list of top bags, since it had been a popular model for several years now. However, it looks like REI has discontinued the Igneo models, although they are still available at a discounted price on REI outlet. 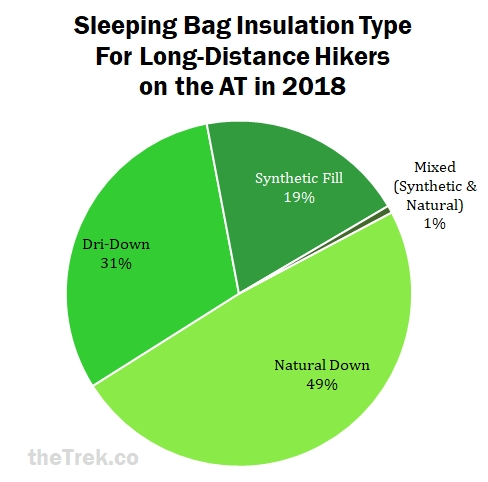 Considering this bag was so popular in past years, the discounted models might be the best buy for hikers looking to purchase a sleeping bag for a 2019 thru-hike. 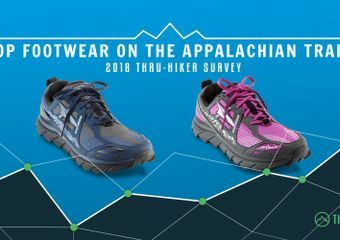 By far the most popular model, for quilts or sleeping bags, was the Enlightened Equipment Revelation, a favorite of 61 hikers, or 20 percent of AT hikers, for the second year in a row. 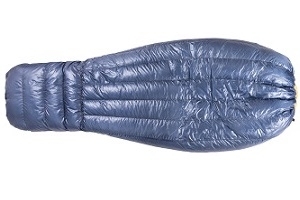 Ranking second for quilts was the Enlightened Equipment Enigma, preferred by 10 percent of AT hikers (n = 32). 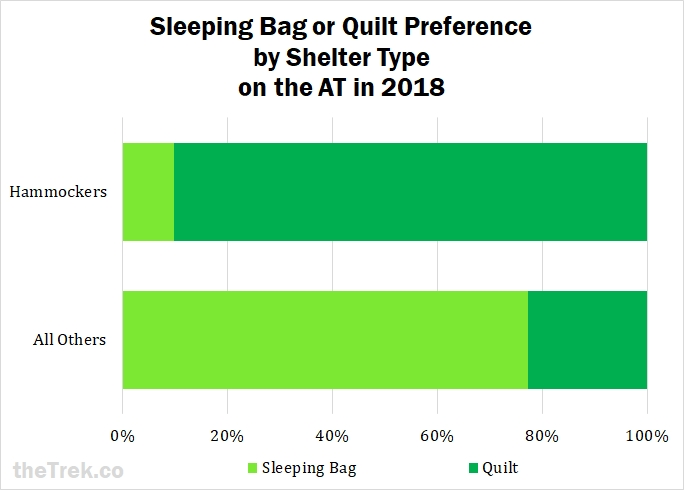 We’ve seen a trend over time where quilt systems have increased in popularity among tent and hammock users, although sleeping bags remain the most popular. For northbounders, a temperature rating of 20F is probably sufficient for the typical thru-hiker. Those starting early (or earlier than the bubble) should consider ratings as low as about 10F. For southbounders, a bag rated 20F is likely sufficient. 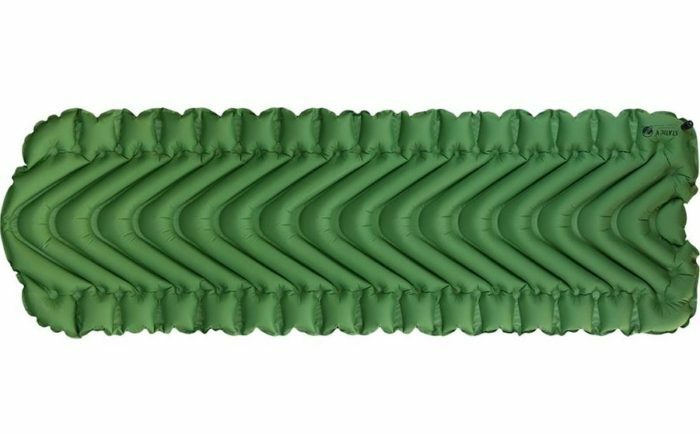 Inflatable pads are recommended for most hikers; those using hammocks generally prefer foam pads or no pad at all. 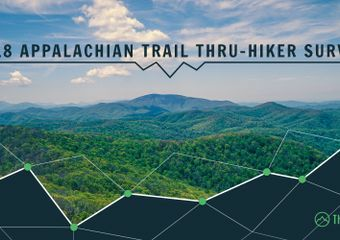 Keep in mind that this is advice for the Appalachian Trail and other trails in that region where trees are abundant, not necessarily desert, plains, or shoreline trails in other regions. 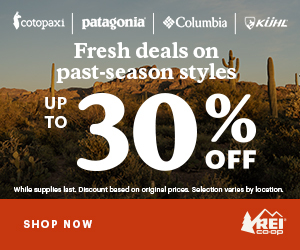 REI remains the most popular brand of sleeping bags used by AT hikers, but no sleeping bag model took a strong lead as the most popular. By far the most popular quilts this year were by Enlightened Equipment, with their Revelation quilt being used by one in five hikers who took the survey. 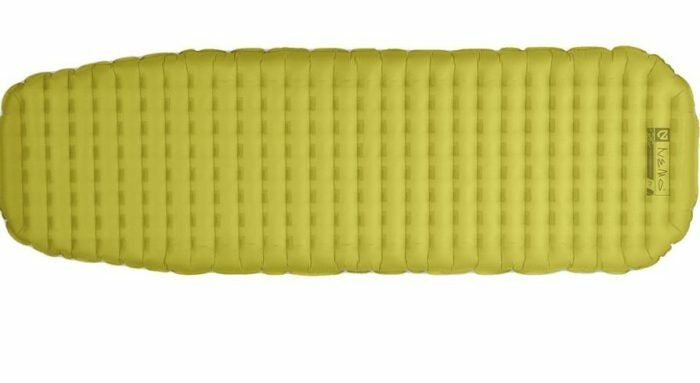 Nearly two-thirds of hikers used Therm-a-Rest sleeping pads, and the vast majority of those hikers used variations of the NeoAir XLite pad. Congratulations to all hikers who completed the entire AT or a section in 2018! Many thanks to those who participated in the survey. Thanks also to Zach Davis and Maggie Slepian for their helpful input and for distributing the survey. Check out our previous posts with general hiker information, footwear, and shelters. To stay updated on the subsequent hiker survey posts, follow us on Facebook, Twitter, and sign up for the newsletter. Be on the lookout for the next two posts on backpacks and on stoves/food/water. χ2 = 14.33, df = 5, p = 0.014. I’m surprised not to see more feathered friend bags. I’d love to see satisfaction data. But I love these articles. How about the following survey question: Do you despise the sound of crinkly NeoAir pads in shelters? Z-lite, all the way. Nice and quiet. Also, doesn’t Klymit make the Static V? Different trails and different methodologies but neat stuff.